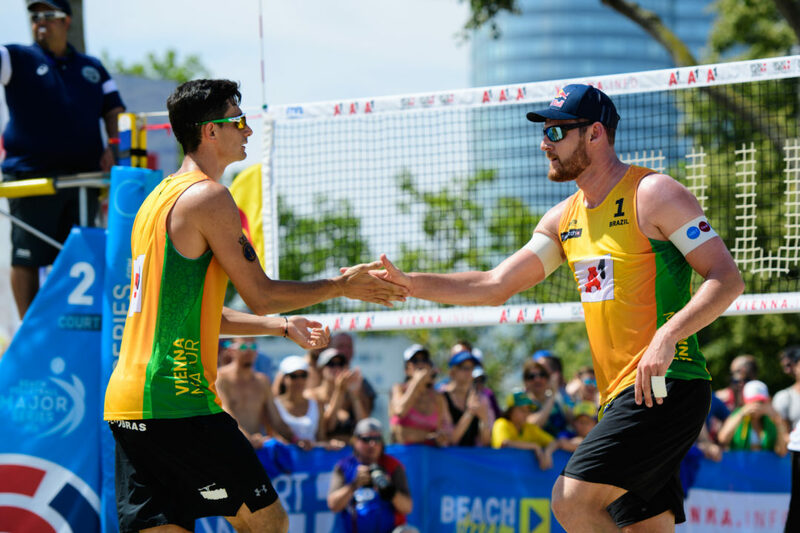 After storms delayed the final eight matches of men’s pool play, the final four pool crowns were handed out on Saturday with teams from Brazil, Latvia, Norway and Qatar earning free passes to the second knockout round. The field was then cut from 24 to 16 with the first of two knockout rounds. No. 24 Cherif/Ahmed Tijan battled through their second tiebreak match in as many days and garnered their fourth win of the tournament including qualifiers, rallying past No. 8 Clemens Doppler/Alexander Horst of Austria. Alison/Andre also went the distance, coming from behind for the 19-21, 21-16, 15-9 win over Canadian qualifiers Grant O’Gorman/Ben Saxton. No. 7 Smedins/Samoilovs bested 10th-ranked Brazilians Vitor Felipe/Evandro Goncalves Oliveira, while No. 3 Mol/Sorum swept No. 19 Konstantin Semenov/Ilya Leshukov of Russia. 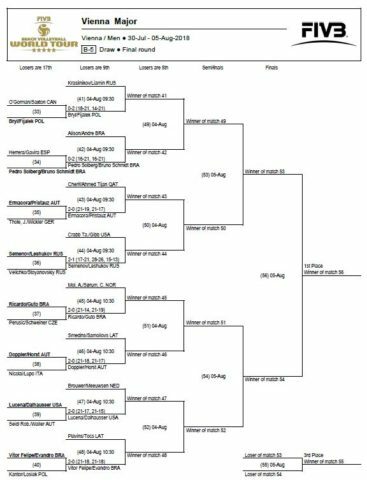 Due to the delayed schedule, the first knockout round also was played on Friday with all but one of the eight matches being decided in straight sets. The lone exception came as Semenov/Leshukov picked up their second win of the day with a 17-21, 28-26, 15-13 win over Russia’s Oleg Stoyanovskiy/Igor Velichko. Top seeded Americans Phil Dalhausser/Nick Lucena ousted Austria’s Robin Seidl/Philipp Waller. Three teams from Brazil also earned victories: Pedro Solberg/Bruno Schmidt, Ricardo Costa Santos/Guto Carvalhaes and Evandro/Vitor Felipe. Four of the top 10 seeds in the tournament were knocked out in Round 1: No. 2 Paolo Nicolai/Daniele Lupo (Italy), No. 4 Pablo Herrera/Adrian Gavira (Spain), No. 6 Piotr Kantor/Bartosz Losiak (Poland) and No. 9 Stoyanovskiy/Velichko (Russia). One of the highlights of Round 2 will be a meeting between former Brazilian partners and 2016 Olympic gold medalists Alison Cerutti and Bruno Schmidt. Cerutti is now teamed up with Andre Loyola Stein, while Bruno is playing with Pedro Solberg. Take a look at Alison had to say about the difficulties of changing partners here. Andre discussed his transition to a more defensive role here. Dalhausser/Lucena will face a tough test in No. 5 Alexander Brouwer/Robert Meeuwsen of the Netherlands, while fellow Americans Taylor Crabb/Jake Gibb will take on Semenov/Leshukov. Another Top 10 matchup will pit No. 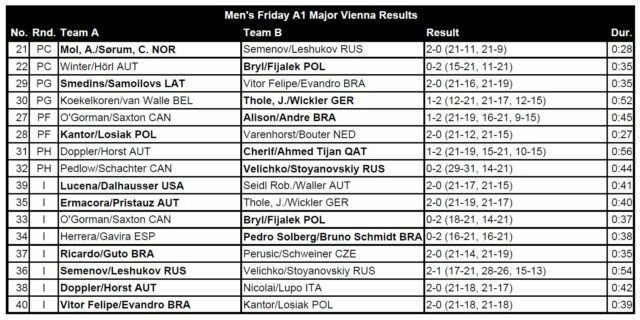 7 Smedins/Samoilovs against eighth-seeded Austrians Doppler/Horst.